I hope you will answer this message and help me! My daughters are hosting a baby shower tea party for their sister in May. I want to know the best and most appropriate way to set a buffet table for 20 people. I have teacups for each guest and assorted teapots. There is a formal dining room table and a server in the room that can be set-up. This sounded like such a pretty way to honor my daughter and her baby girl….I am now regretting the decision as I want it to be etiquettly (sic) as correct as possible. I hope you can help me or direct me! It’s such a good question and I quickly wrote Linda encouraging her not to regret her decision! A tea buffet is a simple and beautiful way to host a less formal tea gathering. In fact, in many tea rooms I’ve visited, guests are encouraged to choose their own teacup before taking a seat. 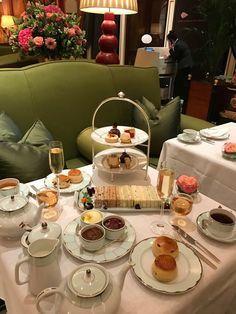 And remember, afternoon tea is not called high tea because it is traditionally served at low tables (like a coffee or tea table) instead of a high table (like the dining room table). Many teas are served from a buffet table. Keep your food pretty, but simple. Serve nothing drippy, extra-hot (except the tea–more on that later! ), or that requires cutting with a knife. Stick to tea sandwiches, scones, and bite-size desserts. Stack salad-size plates for your guests to use for their finger foods. Guests should only have to carry the plate, a napkin, and a teacup with saucer. As I have suggested before, serve only two teas-an herbal/decaf and a black tea of choice that you brew ahead. DO NOT put out a number of teabags for your guests to choose from and expect them to brew their own tea and deal with drippy teabags. Stacked teacups (as seen in the picture above) are an appropriate way to conserve space at the buffet table. Appoint someone ahead of time the honor of pouring the tea for the guests. After offering the guests the two choices of tea, fill the teacup 2/3 full. This allows the tea to stay hot and gives them room for milk and sugar. Hand the teacup to the guest. REMEMBER~when serving tea do not separate the cup from the saucer, but always handle the cup from the saucer only. It’s ideal for your guests to be able to sit by a low table within arms reach. If they are holding a teacup and a plate of goodies, they will need a place to set down one or the other, though they can possibly set their tea treat plate on their laps while holding their cup and saucer. If you leave teapots on the buffet table for your guests to help themselves to another cup of tea, you must plan a way to keep the tea warm. This can be done through a carafe, tea cozy, or warmer. Again, the ideal is to appoint someone to make the tea in the kitchen and roam among the guests providing fresh and hot pours. Does that answer your question, Linda? 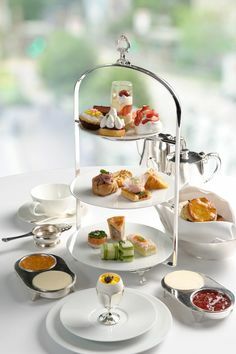 Does anyone else have a question or advice to add regarding serving the tea party buffet-style? Please add your comment below. I agree that buffet tea parties are fantastic! (In fact, if you were invited to tea at the White House, it would likely be a buffet!). I wish Linda all the best! Reading your instructions makes me feel inspired to hold a tea party of my own Jennie. Done your way, it really lifts the event into something special. I once attended a housewarming buffet tea party, and it was so so elegant. These are all great tips. Thank you so much for the wonderful suggestions! The idea for a tea party is very new to me….As a primary teacher, I’ve hosted Teddy Bear Tea Parties but never one as special as the one we are now planning. I am now looking forward to an elegant celebration for my first granddaughter!Thank you so much! I’m impressed to see you come up with so many steps and tips. To me, I never think about how many steps I could or do take to set up any kind of party. Including when my grandchildren all come to the house at once and they are hungry. When I think about it, you are right. There are that many steps to having any kind of party. What a niche you have. This is Great Information. Every woman reading these articles should be moved to host a tea party for some of their friends. As you have stated – it does not take very much to host one. The season is now perfect to host tea parties. Ladies – Let’s get started! I was just asked this past Sunday to host a tea party for the ladies at our church. I came across your website via Google and very glad I did! I have no experience whatsoever with tea parties and your tips are very helpful. But what if I don’t have tea cups and saucers for 20 women? Would it be too tacky to have 20 different cups/saucer sets? I’d have to hit up the local Marshalls/TJ Maxx for enough. The ladies at my church are hosting a buffet style tea party. If all the tea cups, plates,etc. are going to be on the buffete table, what about the tables? Do we leave the tables empty, except for the center piece? I am in charge to decorate. I like the idea of the buffet, but I am not sure about not having the tables empty.